Now on to Bando the main event. removed your post from the TT group page, pertaining to Erik Dorr and the bible. Mark B.
I figured. It’s your site tho as the saying goes. How much would a 506th WWII Helmet go for at auction? Too vague a question-is it a steel pot only or is the liner included? M1-c or M2 D bale? CONDITION? Liner stenciled as well, or just the pot? Is the name of the original owner known? All these details and more would affect the price. Finally, less than 2 percent of 101st unit painted helmets are authentic and original. Mark B. Did you notice that Bando is Riley's lap dog? Remember that Bando said he never gets involved with something that he isn’t a part of. Yet he did just this on the House family. I wonder why as he likes to say. Here is one of Bando's Meltdowns and here is Bando’s own words once again that shows the opposite of what he said in this Meltdown. The sentence before this was attributed to Dorr but this sentence was all Bando’s opinion. 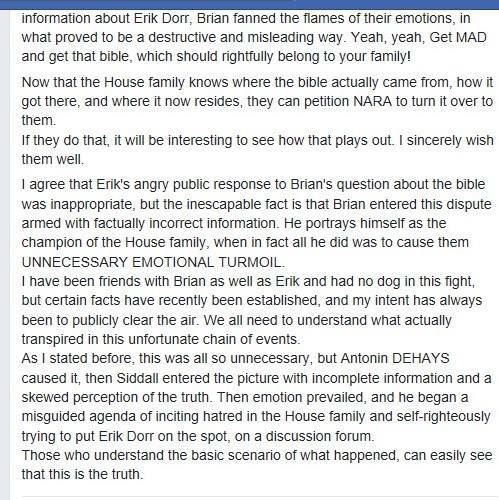 Subject: re: Erik Dorr's story about the House Bible etc. “Does that sound like rational behavior? It's more like an insinuation that you're dealing with a mentally unstable and unpredictable family, so you'd better watch out, because they might do something crazy to you”. Bando called the whole family unstable and then crazy and they might do something. “when in fact all he did was to cause them UNNECESSARY EMOTIONAL TURMOIL” from another one of his Meltdown rants. Here is an email from the House family showing that they didn't know where the bible was until February of 2018 when I told them. If you want unnecessary emotional turmoil look no further than Dorr not telling the House family where the bible was. redeeming aspects to it. If I'm guessing right, you must hate it really bad! I tried to call you a few times today and for some reason I can’t leave a voice mail. I do want to talk to you about all of the “new fans” I have! I will also explain about the book. I went to bed early tonight and am now up, to put my phone on the charger. Bando and I spoke about DeHays for 20 plus minutes about the Book and the Plumley Lovers. I hate liars and Bando is now known that way as Bando knew full well who DeHays was and that I knew Dehays too. That's why Bando sent me the book. By the way Bando, I wasn’t friends with DeHays but a colleague, just like I was a colleague of yours, not a friend. You mentioned why didn’t I tell you about DeHays? Because you already knew that you and I knew DeHays. That means you lied in your Meltdown saying that you didn’t know who DeHays was. 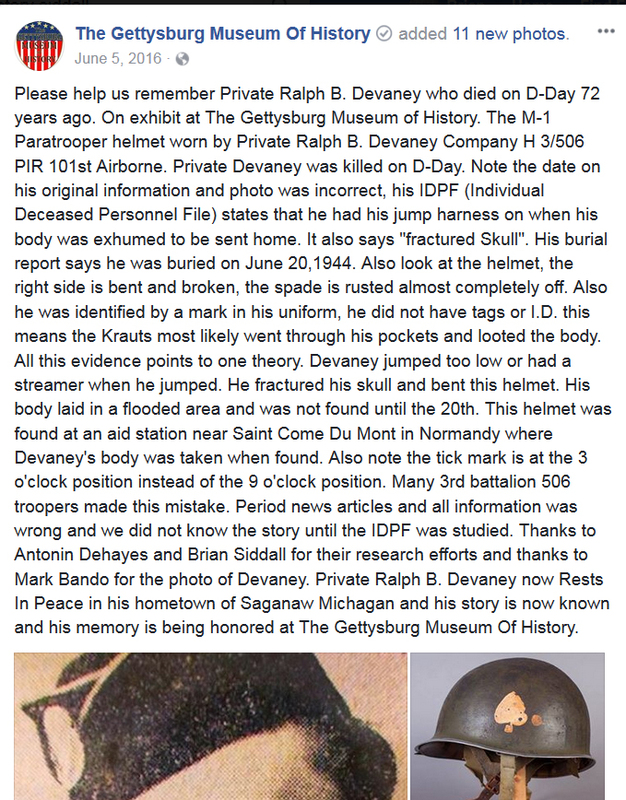 Please also read the Facebook Post from June 2016 from Dorr and the helmet from a man KIA in Normandy. My name, DeHays and Bando are all associated with the Dorr post. How can he now like in the March Meltdown and say he had no knowledge about DeHays and himself? You can't. The emails above this and that I called and spoke with Bando for 20 plus minutes about this very subject. Once again it's all in his own writing in the emails from May 18, 2016. From my House Articles below it clearly shows I spoke of DeHays and that he had been convicted. “A Continuing Attack on the House Family"
The House Bible was stolen from NARA by Antonin DeHays . He then sold it to the TGMoH in 2015 it seems. Remember that the TGMoH on December 23, 2015 spoke of the newest addition. In fact the last communication I remember interacting with Dorr was on FB in 2016. He thanked me for showing him the errors done by Antonin DeHays. I knew Antonin DeHays but had stopped communication with him in 2016. The St. Mere Eglise book had a lot of errors. When I asked him if there was an English version of his History Dissertation he said at the time it was only in French. That’s when I gave up on him”. Even if you didn’t know so what? There are a lot of people I know that you don’t know. I tried to keep the numbers down that I knew you because you were an embarrassment at times. Your ego makes you think that you are the best about everything WWII. That is a patently dumb question posed by Bando. First I didn’t attack Dorr, he attached me. Maybe in your bizarre world attacking someone 9 days before responding is an attack. What “free pass on Dehays?” Why would I report on something that’s already occurred? 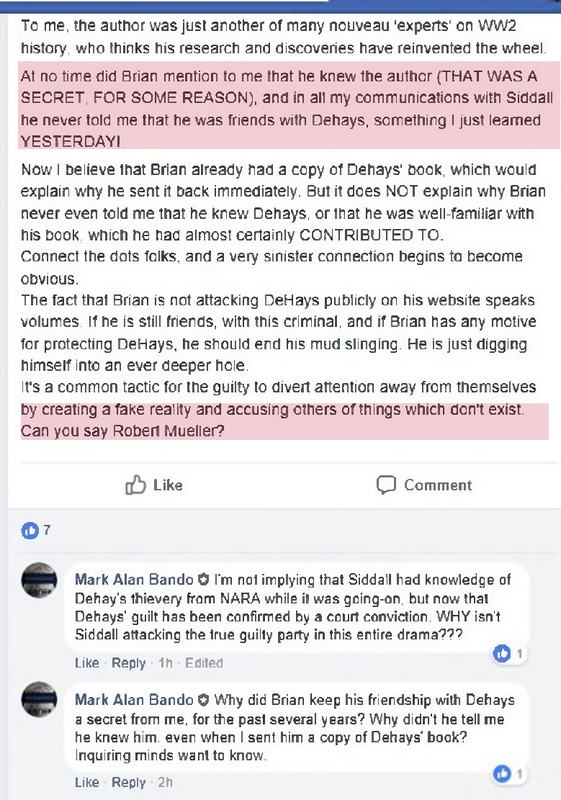 I did put up a link on my FB page June 14, 2017 with the news hit the papers about DeHays and then again to the top of my FB Feed so idiots like Bando lovers could see it. On my second article last month I talk about DeHays twice and have a link about him being convicted. If you notice Bando and his followers give free passes all the time to all of the fakes like Cook, Manoian, Plumley, Colwell, Defer and Casares etc. Did I talk about the fake Ranger from last year in Normandy? Of course not as that wasn’t my article it was Marty Morgan’s work. Does 60 Minutes report on a story from another network? Of course they don’t. I only write an article when it’s my story. There is one more comment about Bando’s Meltdown though. You think I could profit from your fame? That is funny. Your ego is so large you think people outside of your collecting group even know who you are to a large degree? By the way here is the other part of the May 18, 2016 email you sent to me. Your followers might not like what you say about them though. “On another subject, I see the dickheads are attacking you about your Plumley article on FB”. If I’m not mistaken that means you count your followers like Dave Strasz & Doug Topolski love Plumley and you said Plumley Lovers as dickheads according to your email from two years ago Bando.